I’ve been thinking about efficiency. Efficiency talk is everywhere. Car buyers can purchase ever more fuel-efficient cars. LED lightbulbs achieve unprecedented efficiencies in turning electricity into visible light. Solar panels are more efficient each year. Farmers are urged toward fertilizer-use efficiency. And our Energy Star appliances are the most efficient ever, as are the furnaces and air conditioners in many homes. But there’s something wrong with this efficiency solution: it’s not working. The current environmental multi-crisis (depletion, extinction, climate destabilization, ocean acidification, plastics pollution, etc.) is not occurring as a result of some failure to achieve large efficiency gains. The opposite. It is occurring after a century of stupendous and transformative gains. Indeed, the efficiencies of most civilizational processes (e.g., hydroelectric power generation, electrical heating and lighting, nitrogen fertilizer synthesis, etc.) have increased by so much that they are now nearing their absolute limits—their thermodynamic maxima. For example, engineers have made the large electric motors that power factories and mines exquisitely efficient; those motors turn 90 to 97 percent of the energy in electricity into usable shaft power. We have maximized efficiencies in many areas, and yet our environmental problems are also at a maximum. What gives? There are many reasons why efficiency is not delivering the benefits and solutions we’ve been led to expect. One is the “Jevons Paradox.” That Paradox predicts that, as the efficiencies of energy converters increase—as cars, planes, or lightbulbs become more efficient—the cost of using these vehicles, products, and technologies falls, and those falling costs spur increases in use that often overwhelm any resource-conservation gains we might reap from increasing efficiencies. Jevons tells us that energy efficiency often leads to more energy use, not less. If our cars are very fuel efficient and our operating costs therefore low, we may drive more, more people may drive, and our cities may sprawl outward so that we must drive further to work and shop. We get more miles per gallon, or per dollar, so we drive more miles and use more gallons. The Jevons Paradox is a very important concept to know if you’re trying to understand our world and analyze our situation. The graph above helps illustrate the Jevons Paradox. 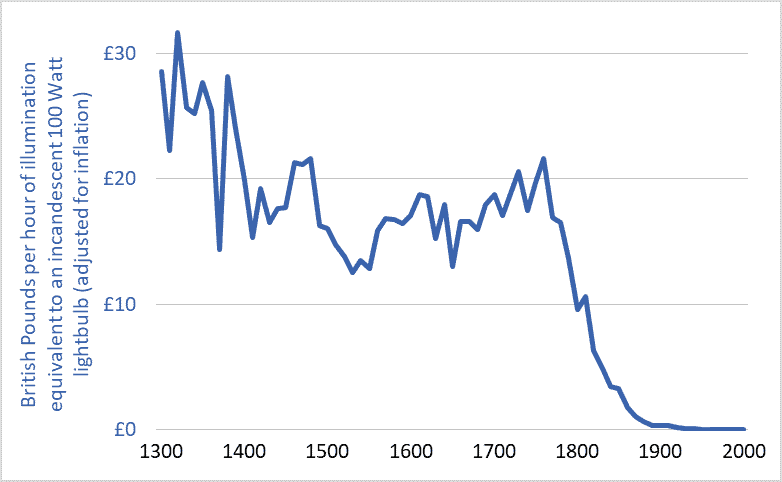 It shows the cost of a unit of artificial light (one hour of illumination equivalent to a modern 100 Watt incandescent lightbulb) in England over the past 700 years. The currency units are British Pounds, adjusted for inflation. The dramatic decline in costs reflects equally dramatic increases in efficiency. Adjusted for inflation, lighting in the UK was more than 100 times more affordable in 2000 than in 1900 and 3,000 time more affordable than in 1800. Stated another way, because electrical power plants have become more efficient (and thus electricity has become cheaper), and because new lighting technologies have become more efficient and produce more usable light per unit of energy, an hour’s pay for the average worker today buys about 100 times more artificial light than it did a century ago and 3,000 time more than two centuries ago. But does all this efficiency mean that we’re using less energy for lighting? No. Falling costs have spurred huge increases in demand and use. For example, the average UK resident in the year 2000 consumed 75 times more artificial light than did his or her ancestor in 1900 and more than 6,000 times more than in 1800 (Fouquet and Pearson). Much of this increase was in the form of outdoor lighting of streets and buildings. Jevons was right: large increases in efficiency have meant large decreases in costs and large increases in lighting demand and energy consumption. Another example of the Jevons Paradox is provided by passenger planes. Between 1960 and 2016, the per-seat fuel efficiency of jet airliners tripled or quadrupled (IPCC). This, in turn, helped lower the cost of flying by more than 60%. A combination of lower airfares, increasing incomes, and a growing population has driven a 50-fold increase in global annual air travel since 1960—from 0.14 trillion passenger-kilometres per year to nearly 7 trillion (see here for more on the exponential growth in air travel). Airliners have become three or four times more fuel efficient, yet we’re now burning seventeen times more fuel. William Stanley Jevons was right. One final point about efficiency. “Efficiency” talk serves an important role in our society and economy: it licenses growth. The idea of efficiency allows most people to believe that we can double and quadruple the size of the global economy and still reduce energy use and waste production and resource depletion. Efficiency is one of our civilization’s most important licensing myths. The concept of efficiency-without-limit has been deployed to green-light the project of growth-without-end. Jevon’s Paradox is real and explains why improving energy efficient rarely delivers the theoretical benefits gained in doing so. But I wouldn’t knock the idea of saving energy totally on the head, as if it’s a wrong thing to do. When asked: “Is better to save energy or generate new energy supply to meet demand” I will always side with the efficiency argument, if for no other reasons is that our civilisation is obsessed with growth. Of course this can be taken too far, because efficiency has limits if not grounded into a framework where powering down becomes the hallmark of everything we do. Basically the anti-efficiency argument says, if I insulate my house and reduce my energy consumption then I will use the financial benefit to (say) go on a jet setting holiday and that decision will ruin any benefit from insulating my home (to use a simple example). The argument here is not that doing things efficiently is a bad thing to do, but thinking of it as a golden solution when nothing else in society changes much renders it pretty useless in the scheme of things. I’m a great fan of energy efficiency (and water and food and……..) but when we applied efficiency measures, we turned the savings into moves to simplify our lives. So instead of spending the savings on [insert your favorite toy/activity] I actually gave up paid work……. by abandoning the Matrix – more or less – we made the efficiency gains lower our footprint. The lure of more toys is very hard to ignore, Mike. You’re obviously immune! Efficiency in the context of ongoing growth will only enable more growth. Efficiency in the context of deep resource constraints (like peak oil) or a concerted effort to reduce pollution and consumption, will enable material austerity without economic austerity. Peak oil turns out not to be here yet, and there’s plenty of coal and gas as well. Peak oil won’t save us from pollution. Therfore, we *need* a concerted (concerted means political) effort to reduce pollution and consumption right across society. The cheerful efforts of a few enlightened homesteaders won’t stop the corporations from striving for increased profits or the world’s billions of proletarians from their (our) efforts to improve their lot in the world. Nor should we denigrate those efforts per se … we need to limit the destructive consequences of the present way of doing things, not the constructive urge of humanity. Thanks very much for your interest in my research. I really appreciate it. You’re very welcome, it’s always nice to come across like minded people…..
labour input per quantum of food produced,it is the most efficient system. When an energy analysis is done,a different story emerges. each calorie of food consumed. fossil fuel input has an energy input of about one calorie (from muscle power) for per twelve calories,of food consumed,or about 120 times as efficient as the industrial average. I looked a Qualman’s blog. He’s spot on with the efficiency article, but miles off in the wilderness about the national debt. The national debt is a savings account for bond holders so it’s wealth, not liability. That’s not the issue in the article. The Bonds, whether or not they are worthless get face value at maturity plus accumulated interest. They are popular because they have a government guarantee. Only the Fed /central bank can do it. Qualman doesn’t appear to have a comments box. Qualman claims “it is very important that we move very rapidly to maximize the number of EVs built and sold.” Doesn’t sound very eco-friendly, does it? “Let’s buy more stuff” is a bad idea. Besides, if EVs become a massive hit, petrol becomes cheaper. Then those who still have petrol-fuelled cars drive more. In the end, EVs have increased global carbon emissions. Where does he mention EV’s? It’s very hard to challenge EVs, even within environmental circles. I have best success in arguing to green people that in the scheme of things changing the engine under your bonnet may be a good thing to do but it is a very light green direction to go. A 4-lane highway clogged with EVs is not too different to a 4-lane highway clogged with ICs. Much better to focus on getting people out of cars as a higher priority – looking at congestion, public health etc. But, sorry to say, most citizens are married to cars and dearly want to keep driving, so it’s an uphill battle. EVs will get rolled out in their hundreds of millions before we hit the proverbial wall. I think we have a causality/correlation misattribution going on here. If something gets 50% cheaper because of efficiency gains, I may use twice the amount I used to, but that’d be the same amount of underlying energy. In other words, if I have $200 to spend on transportation, and money substitutes for energy, I’m likely to still spend that $200 because I have it. I don’t see how growth in the *total* used energy could be accounted for by Jeavon’s. More likely it would be because of cheaper energy, population growth, or societal shifts thanks to pernicious marketing. If Jevon’s Paradox is real – which it is – as everyone is pointing out (except for gbell12), I guess the next question would be how real is EROEI? Surely these two trends move in the opposite direction. If that’s the case then at some point EROEI would undermine the Jevon’s Paradox or severely stint its growth (?) – at least in some respects. Good point. Haven’t heard it put that way before. Re-read my comment please, you’re misrepresenting my argument. Happy to clarify if needed. If you could clarify that would be appreciated. If my understanding is correct, Jevon’s applies to all exponential growth, including population growth, higher consumption of cheaper energy, more and more marketing, etc so the total used energy would be effected by all of the above. Perhaps you could explain the causality/correlation misattribution. Said differently… the total used energy would be CAUSED by population growth, higher consumption of cheaper energy, more and more marketing, etc. That’s my understanding as well. But Jeavon’s Paradox addresses only the effect of efficiency gains on resource consumption. In other words, growth in consumption has so many factors that I don’t think Jeavon’s Paradox can be pinpointed as any more an effect than anything else – especially overall population growth. The Jeavon’s paradox is also often stated incorrectly, as if it’s a law of physics that energy efficiency must result in an increase in energy consumption. More correctly, it is the main reason that full theoretical energy savings are rarely achieved through efficiency measures. Insulate your main living area… reduces your power bills… makes it thus affordable to heat your whole house. Back to square 1. But you don’t have to do the last bit. Again, Jeavon’s paradox is often misleadingly used to shore up supply arguments. In so doing, making efficiency gains is made to look pointless. It’s very easy to add to this misconception. – Yes, but if more and more people use evermore efficient and cheaper services or products the increasing amount of consumers cancels out the energy efficiency and more energy is used anyways. James G. Anderson is a Harvard professor of atmospheric chemistry. But EVs damage the environment and climate too. Do they reduce the demand of crude oil? No. Agreed, but that brings is to the problem of human self-control. Humans seem to not naturally want to conserve energy. They would generally tend to prioritize comfort and convenience, which take energy. The obvious conclusion people will make is that it is therefore more sensible to make up a shortfall in supply by boosting energy supply rather than even trying to modify demand. Recently a colleague who advises on sustainability told a workshop I was at that if you say had to deliver 15 MW to meet a gap between supply and demand that, with the low cost of renewable energy, it has become more sensible to focus on just adding supply. “Just chuck in a wind farm… much less messy”, to quote him directly. I was rather taken aback because environmentalists have traditionally argued that there are limits to forever going down the supply side route. This is where hammering on about Jevon’s Paradox as a negative takes society to where it is much more comfortable – growth. We love it. I think you are saying this impulse is so ingrained that there’s no point even trying to go in another direction because human nature will defeat any attempt to do so. I take that on board but won’t switch over myself because I don’t think we should just join the majority. Even if that makes me naive. – Actually, that’s not what I’m saying, although it may sound like it. I am just stating how I perceive human nature to be – after I have taken a deep dive into psychology and have thought about it deeply and have observed human behavior and have experienced being ignored over and over and over – and have come to the conclusion that the vast majority of people just don’t care. They live for the moment. WE are the pioneers – WE care. WE are the ones who are at least making an attempt to act as role models or catalysts. But, for the moment we are a minority. Our very role is to keep on going. Although some people give up along the way when nothing works.My approach now is to show humans their own nature, because most can’t see it. Personally I hope there is some kind of fail-safe mechanism in the universe that would save us from ourselves – and I’m wondering if that fail-safe mechanism is not perhaps declining EROEI. I think I’m more on less on same page. But do note that questioning renewable energy and energy efficiency (for good reasons) is very easily read as giving succour to where we came from. It’s automatically read that way by people who don’t think deeply. This is another human foible we have to contend with. It stems from the bipolar binary dialectic that dominates the common world view. Perhaps if you expand and elaborate on your point with examples one could analyze it, but I would say that growth in consumption comes from human nature, because Jevon’s paradox applies to human nature. So what we are dealing with here is “accelerationism” – Jevon’s Paradox once again – all the way to the end…. Yes, commentary under Gail Tverberg’s blog of late has developed a strong argument that with the imminence of collapse and our society being built on dense energy human’s only option now is to make it last as long as possible. Thus is an immediate survival thing. Staving off collapse within our own lifespan can best be done by fostering the continued burning of fossil fuels in order to keep the machinery going. Though logically understandable, I find this movement somewhat distasteful because it allies people concerned about the future with those on the other end, those who drive, and profit from, the capitalist world, both movements now both singing from the same sheet. But I can see why the rise of such a movement would be inevitable. We need efficiency, but we also nedd a lot more of less. Smaller cars or no cars, less useless stuff, less complexity. In our search for efficiency it is essential we don’t sacrifice resilience (which is our usual path). Get rid of all the useless junk and your thinking changes. It is such an effort going through everything that you really do think twice about getting more useless stuff. An older car and some money in the bank, is so much easier on the mind than a flash car with a big loan. A smaller house with only the stuff you need or love is so much less effort than a Mc Mansion full of meaningless crap. Those who cry out that efficiency is a waste of time, owing to Jevon’s Paradox, should be quite contented with the status quo. The majority of citizens buy big lumpy cars when they could buy a small one, they live in 300 sq metre homes and have 500 litre fridges. Few choose to travel efficiently on bikes and nearly all fly in jets rather than slow travel. We have the per capita energy consumption of 100 slaves or more. Jevon’s Paradox is not much of an issue. Or you could say everyone lives this way because of Jevon’s paradox. In which case advocacy for energy efficiency takes us to a closed circle. I think your example highlights a widespread misunderstanding of what Jeavon’s Paradox is. It’s not when increases due to growth swamps decreases due to efficiency gains. It’s when increases occur BECAUSE of efficiency gains. If I’m spending less on fuel for my super-efficient car, I’m likely to drive more, using more fuel. I’m doing that because my car is so efficient. And the paradox happens because I feel so great about my super-efficient car that I over-shoot – I actually end up using more fuel than I would have if the car wasn’t super-efficient. Thanks for pointing that out – my understanding of it included both types of increases as you defined them above. Nevertheless, the growth that is swamping energy efficiency gains mainly due to an ever increasing demand for everything because of modernization and industrialization, meaning more people want Western lifestyles and comforts has a real impact, so we can’t not take it into account. That said, I fully support energy efficiency on all levels, but what is lacking is education. In other words, we need to create a culture of low energy consumption. But that now seems to be discouraged by even some of the leading energy transition pundits, because the fear it will bring the collapsing of the economy apocalypse. What to do? Those of us who conserve energy and make use of energy efficient appliances, components and fittings are basically whistling in the wind, but at the same time we cannot compromise our own ethics. It’s not just about one consumer’s rebound effect, it’s also about the rebound effects on the wider market thanks to, for instance, improved energy efficiency in the fuel industry itself (this in particular was a big deal in Jevons’ time: collieries, and railways transporting coal, were big users of coal-fired steam engines), and reduced demand for fuel in one place effectively making the same fuel cheaper for use in another place.